Nostalgia says “Do Over!” (I ask “Why?”) – Your Roots Are Showing Dearie! Yes, there’s a war going on Down the Rabbit Hole. (Again). For any newcomers, and there are quite a few of you actually, I apologize as I unfortunately drop you into the thick of it, to fend yourselves as best that you can. (To make it up to you, I will make a list of her misdemeanors at the end of this post.). Nostalgia has been interested in genealogy for a few years now; and it is shy of a couple of miracles that any of my research notes and references have survived. Last night was Attempt #3. MiLady and I were enjoying a quiet evening reading, when the Olde Banshee floated into the room and occupied the seat at my computer desk. “Have you started your do over yet, Rabbit?” she inquired. “What?” asked my darling as she turned to look at me and take in my surprised expression. Gia shot a backwards glance at my soul-mate to give her a curious look, before resuming her terrorist attack on my research! I, in the mean time, darted from my comfortable seat to launch a rescue salvo in my defense. 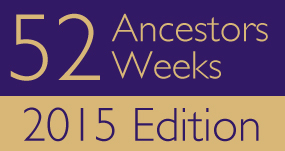 “How can I participate in 52Ancestors, this year?” I inquired. “How many was that?” she asked. “I think so,” I said quietly. “… And what is this mess?” she exclaimed after opening the wrong folder. “And you can read this chicken scratch?” she leered. After rolling her eyes, Nostalgia pushed away from the computer desk. She glanced quickly at her phone and typed a couple of keystrokes. Her eyes then went wide with discovery as she got to her feet. “It might be advantageous, this year, if you do not participate in the Do Over, Rabbit,” she announced. “And why is that, Gia?” I inquired, mostly out of courtesy. When the Old Banshee was gone, MiLady looked at me with a devilish smirk. Call of the Wild – Guess Who’s Back Again? Next Benedict Arnold: Black Sheep -= or =- Loyalist?